My son, now 3 years old, has developed quite an imagination. I really revel in the fact that he can wander into imaginary worlds or create imaginary games and beings. As a child, when lonely, I often relied on my imagination to pass time. It’s a great tool. I fully encourage my son’s ability to create things in his head. My son loves the barbershop. He loves to sit up really high in the tall barber chair. He loves the scissors that go “cutting cutting,” as he says. He loves the clippers that go “bzzzzzzzz.” He loves the water bottle that goes “pssst pssst.” He loves the cash register and the “ding” it makes when the drawer opens. And of course, he loves when the barber gives him a lollipop to eat after the haircut. It was only a matter of time before the barbershop would become a subject in his imagination. For his birthday this year, among many gifts, my son received a lollipop that spins when you press a button on the handle. I suppose that’s the lazy lollipop eater’s way to lick a lollipop -- with the mechanism, there’s not much work to be done. The toy was a big hit with my son. He loved its sound and motion. But once my son devoured the lollipop, he eagerly sought out a new use for the spinner mechanism. That lollipop spinner instantly became a barber’s clippers. The toilet became the barber’s chair, the sippy cup became the water bottle, and a set of “Bob the Builder” toy pliers became the scissors. And I became the barber’s customer. All this was created from my son’s wonderful imagination. Wow. I was so proud. 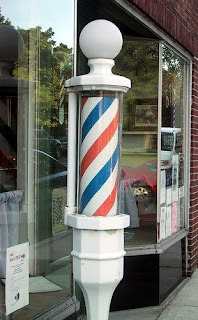 But once I left the “barbershop,” my son expected me to come back as his second, third, fourth and fifth customers. That was when I knew I was in trouble. I should’ve known better. After all, a game of peek-a-boo could keep him entertained for three days straight. The first 20 “haircuts” weren’t so bad. But at 50, I’d had enough. My scalp actually became raw from that lollipop spinner. I thought I felt blood dripping off my head after that 50th haircut, but I later found out that the drop was only a bit of milk from the barber’s water bottle -- I mean sippy cup. “Okay, let’s play a new game,” I told my son. “No, let me give you haircut,” he replied. For the record, I’m writing this column on my laptop computer during haircut No. 326. Hooray, We're Going to Disneyland!